Phoenix Tel Data is a licensed, bonded, and insured Low Voltage Contractor specializing in all things voice and data. We are a locally-owned small business servicing all of Maricopa County. Whether your company needs a single Ethernet drop, structured cabling in an office building, a voice and data network of any size, IT and server support, distributed audio, building access, or video surveillance, we can help. We invite you to browse our pages and take a look at some of our finished projects. When you’re ready, call or email us and let us know how we can help improve your business! Our goal is to deliver top quality service and products. We seek to first understand your needs, propose a solution, deliver on our promise, and finally, to exceed your expectations. We will always deploy the cleanest, friendliest, and most knowledgeable technicians to your place of business. If we do our job right, we believe we will be remembered, and be asked back when you have your next need. 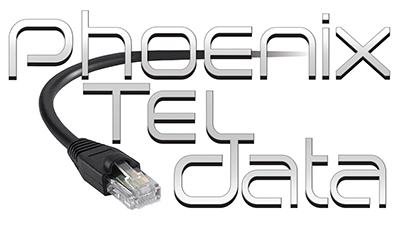 Phoenix Tel Data was founded in 2013. We evolved from our sister company, Secure Cloud Solutions. Since our inception, our customer base has grown to include some of the largest and most respected businesses in Phoenix. We enjoy serving clients in size from one employee to thousands. As our philosophy states, treating the customer right is our primary goal. We're proud to have Phoenix as part of our name and to call this great city our home. We look forward to hearing from you.